As a wee lad, I used to dread the idea of dressing up for church or a special occasion. It involved so much effort for me to find the right outfit that would please my mother. Worst of all, most suits and formal adult wear doesn’t fit me. I went shopping several years ago at a Burlington Coat Factory. I needed something fancy for an academic conference. In the whole store, I only fit into two outfits. Sadly, I am cursed with a skinny waist. Despite being forced to shop in the boy’s department, I’ve learned that ties make me unique! I don’t particularly care to be the center of attention. I don’t wear them to look cocky or rich. Ties make me feel awesome and give me the confidence to do the right thing! The old saying is true! Dressing like a boss makes me feel confident and in charge. Success in life doesn’t come easy. It requires hard work, dedication, and patience. Most of all, you need a positive attitude. Everyone has different rituals and routines to energize themselves. Certainly, I have own share of morale boosters, like my quiet time with God, telling jokes, and eating pizza. Ties are in that same fold because they remind me of my life’s mission: put others before yourself! That’s philosophy runs contrary to modern American culture, but it lays the foundations for truly joyous living. While the world says to get to the top at you can at whatever cost possible, outrageous fame and wealth ultimately leaves you empty. The majority of renowned musicians and Hollywood stars all suffer from a problem of the heart. Some kind debilitating depression, substance abuse, or relationship issues seem to cloud their careers. Don’t misunderstand me; money isn’t the problem. Rather, the real issue is defining success. If you live only for yourself, what have you accomplished? Great men and women have left their mark by living humble and quiet lives. History is kind enough to remember a few as examples for us. The moment you realize you’re not the most important person in the world is when life becomes easier. Of course, trials and tragedies always creep up in life. That’s inevitable. Success, in my eyes, is not simply overcoming life’s challenges, but pouring yourself into others despite difficulties. Real love is sacrificial and unconditional. Such a radical form of love may cost and drain you, but the joy it creates overshadows everything else. When caught in a pickle, you are often forced to choose between the safe and the right thing to do. I wear snazzy, colorful ties because they make people smile and laugh. You should always dress for the job you want. My job in life is to make other people happy. That’s the right thing to do! Your turtle’s 13th birthday! He’s a finally a teenager! Cowabunga! Your neighbor’s hurricane party! Survive Irma in style! Halloween! Mix things up and try dressing as Bruce Wayne, instead of Batman. If you’re looking to don a more frightening outfit, a fancy dressed lawyer, salesmen, or politician will surely give children nightmares! Church service! Where else should you give off inspirational vibes? On a jungle safari! Calming colors, like baby blue or maroon pink, will likely soothe an angry lion and protect your caravan! First dates! Intricately designed ties, like with polka dots or dollar signs, will really show you took the time to prepare. Make the moment special and one she (or he) will remember forever! While baking cookies with grandma! You might be terrible at baking, but with a tie, at least grandma and you will have fun together! Do Ties Earn You Respect? 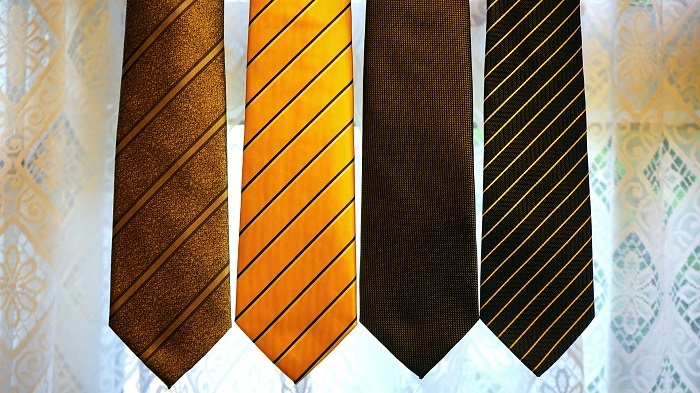 People may argue ties should be standard in some workplaces as a form of respectable etiquette. When I was a teacher, I tried to test that theory. I thought children might respect me more if I dressed as someone who “meant business”. For some kiddos, it certainly affected them, but most students felt disconnected from me. Perhaps the particular culture of the school skewed their perception of formal wear, but, regardless, I mostly gave up the trend. I discovered most students respected someone who wasn’t afraid to jump to consequences if needed. It wasn’t the suit and tie that automatically gave authority, but rather my decisiveness to act. You earn respect in your field by being responsive, flexible, and bold in the face of unforeseen situations! You can wear a tie every day of the year, but that doesn’t in it of itself change anything! You have to look and act the part you want to play! Wearing ties implies a profound responsibility to uphold certain traditions of manhood! If you wear a tie, you need to act a gentleman! You’ll have respect if you model respect! You set the example, even when no one else follows. Remember: the secret to life is about doing the right thing for others regardless of whether you are appreciated or remembered. Is the Tie Right for You? Well, it depends! I wear ties because they work for me, but you need to be you! No one else can live your life for you! You could try wearing ties and see what it does for you. It certainly wouldn’t hurt (assuming you don’t have them too tight); although, you should explore life yourself. Get out there and take a risk finding what makes you special! I don’t mean for this post to push for everyone to wear ties. Maybe you prefer bowling, flip flops, ponytails, or a curly mustache. Go forth and conquer! I Have Eternal Value. The Tie is Just the Reminder. We can all find hobbies and way to pass the time, but it’s all temporary in the end. Just keeping yourself busy isn’t the answer to life. You’ll get bored of one thing and jump to the next. Don’t let yourself get caught in a downward spiral! Western materialism offers no salvation to the void in our hearts. The itching desire for more never ends. The mad rush for “success” leads to a shallow emptiness. No gadget or gizmo can mend our broken spiritual condition. There’s a sin problem buried deep in our human nature that only a divine intervention can redeem. You can dress up the outside, but you cannot heal the soul sickness on your own. Living for others starts by giving up control of yourself. I’ve had my ups and downs in life. It was difficult hunting for a career and discovering life myself. I used to feel crushed by seeing doors close and friendships pass. Throughout everything, I have confidence I am perfectly loved and accepted by God through my faith in Christ. Ties make someone appear important, but I know I have an eternal value that no one can take away from me! When life doesn’t go your way, you can feel tempted to think, even believe, really negative thoughts. The devil sweetly whispers, “You don’t matter. You’re worthless. You screwed up again!” How do you get the lies out of your head? You could try dieting, exercising, and happy thoughts. As for me, I stick to the powerful reassurance of Scripture and prayer. Then, wearing ties acts as a visible reminder that I do matter and my destiny is secure! Do you have an insightful philosophy? Hire me to blog about it using my freelance writing services! What’s your philosophy on ties? I’d love to hear from you!